We Catholic bishops of Indiana recommit ourselves and our dioceses to welcoming others as Christ himself. In the Gospels, we learn that our neighbor is anyone who is in need — including those who are homeless, hungry, sick or in prison. A neighbor may well be a complete stranger whose background, experience or social standing is very different from ours. Persons have the right to migrate to support themselves and their families. As Catholic bishops, we wholeheartedly support efforts to further develop our nation’s laws concerning the migration of people to our country. Current laws and immigration policies are inadequate to protect the rights and dignity of immigrants and their families. 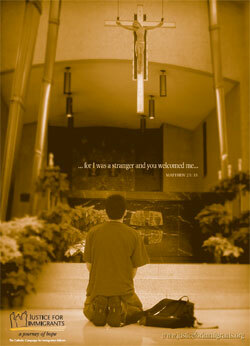 Join us in meeting Jesus in our new neighbors. Each Monday a new picture and quote is released in English and Spanish that can be shared on Social Media. 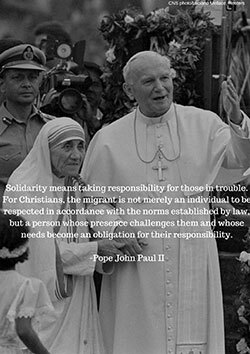 Check back with JFI weekly to see the new new #Migration Monday or email acube@usccb.org to be put on their email list.